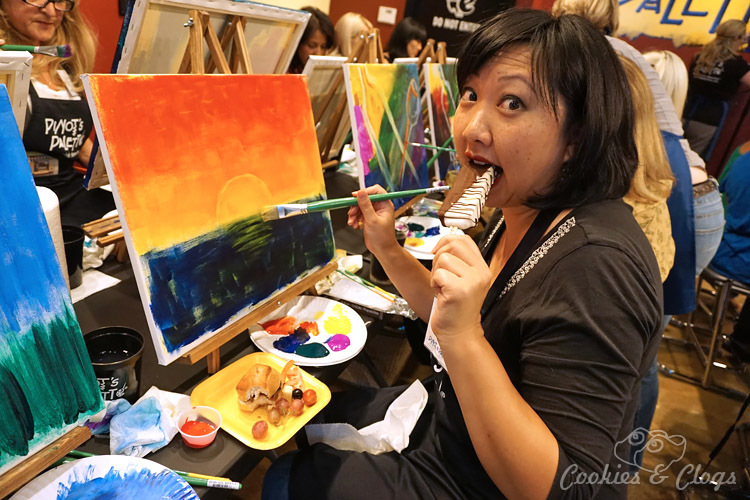 When I first heard of events where groups of people get together to drink wine and paint, I have to admit that I didn’t really get the appeal. As I learned more about it and saw more photos from such events, though, my curiosity was piqued. 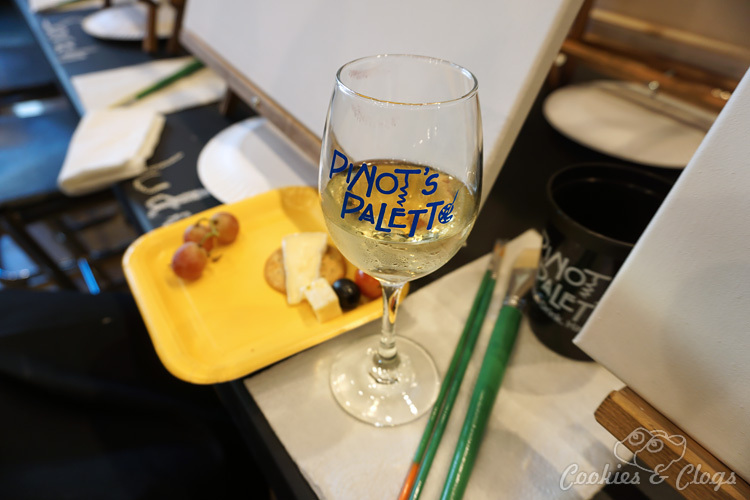 I’m not a wine drinker (never could get accustomed to the taste) but the painting part sounded like fun. So, when a new studio in Alameda, California invited me to a pre-opening event. I jumped at the chance to attend. Plus, Alameda was my teenage stomping ground and it would be fun to head over there again. Since my mom is pretty crafty and lives near Alameda, I invited her to come along with me. We were each allowed one guest and I figured it could be a fun mother-daughter/ girls’ night. She agreed. Turns out that she once tried to sign up for such a class at another venue but something went wrong with the order code. 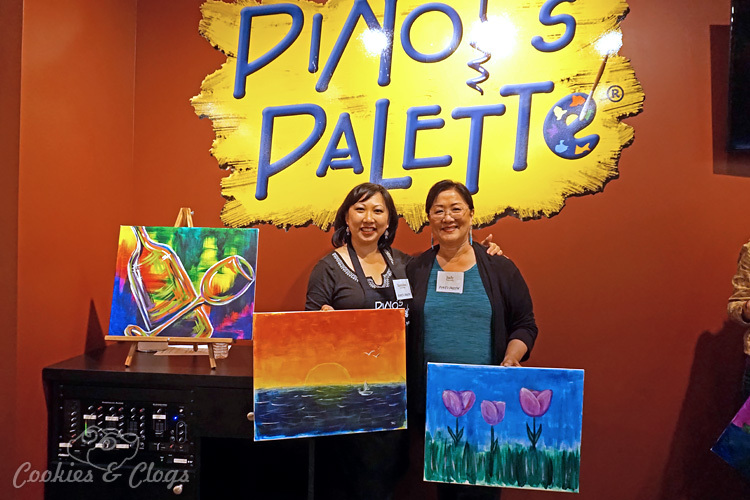 A couple of weeks later, my mom and I headed on over to the new Pinot’s Palette at South Shore Center. The studio was spacious and bright. 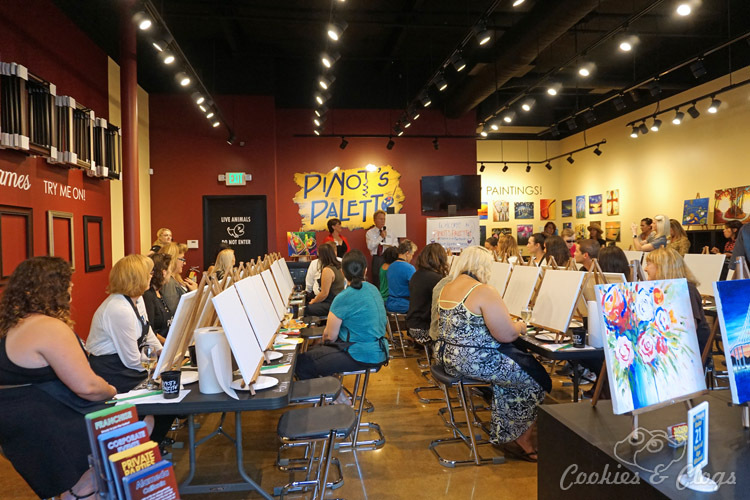 Unlike other paint and wine events that happen in bars or restaurants, Pinot’s Palette is a dedicated studio space used only for classes and private events. Plenty of sample artwork is prominently displayed so you can get a good idea of the types of art the classes will cover. The owners introduced the event. 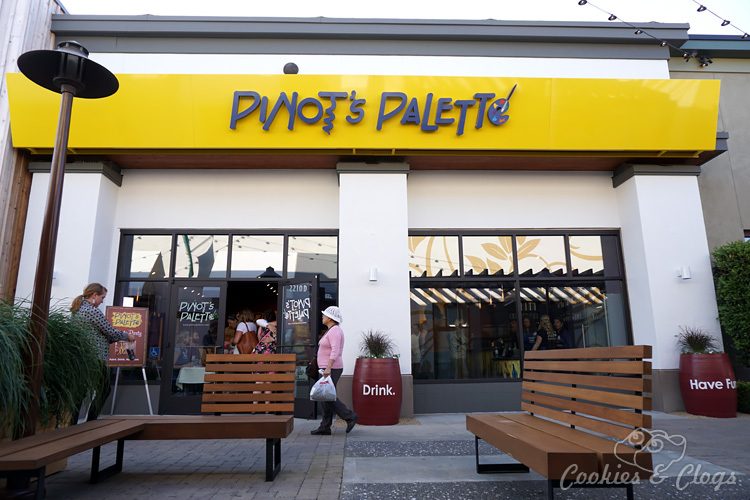 They are a sweet couple that wanted to get out and do something different, so they opened this location. We put our things away in the back cubbies, put on a smock and sat down at the workstation with our names on them. Oh, we also got something to drink and eat too (the snacks were for this particular event is not part of a regular class). My mom really enjoyed the white wine being served that evening. 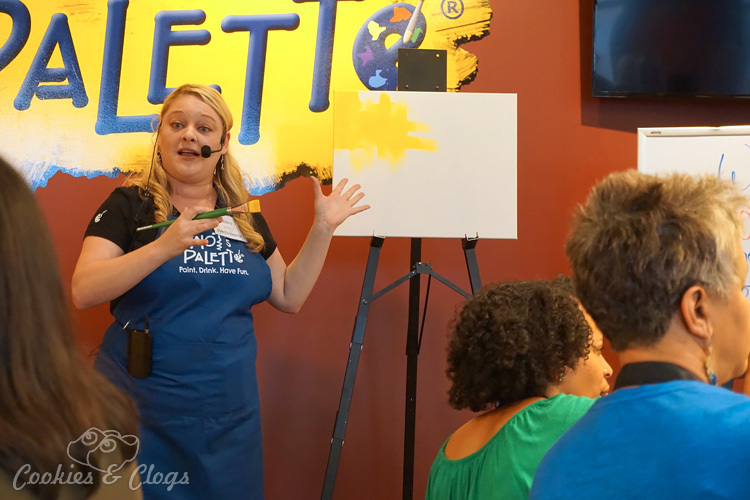 Paints for the featured piece are already apportioned out on a plate in front of you. The instructor is kind and goes through each step with you and allows time for you to finish. In case you mess up or really need help, several artists roam the room and can come over for some hands-on assistance. Lively music is played during instruction breaks. 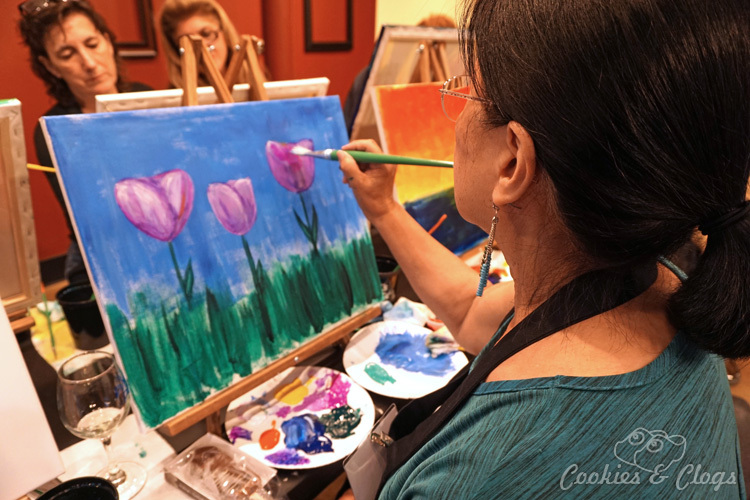 Generally, when you book a class, you know ahead of time which painting will be taught and chose the day and time according to your preferred art piece. Since this was a special VIP event, we didn’t have the option to choose a design we liked. At the outset, the instructor said we didn’t have to feel pressured to use the same colors or same design. My mom decided to paint another picture that was displayed on the wall and, with her leading the way of rebellion, I did the same. It seems that we were the only two to paint something different. A few other changed their designs slightly but we just totally went rogue. Fortunately, the resident artists were still helpful even when we doing our own thing. Thank goodness because we needed some serious help at times 😛 However, now we both have something that’s our style and that we actually would want to hang in our homes. Overall, the event was fun, the staff was friendly and helpful, and the experience was fantastic. Participating in an instructor-based class with no experience or talent required was both comforting and relaxing. Both my mom and I gained confidence in painting and can’t wait to do another class soon. 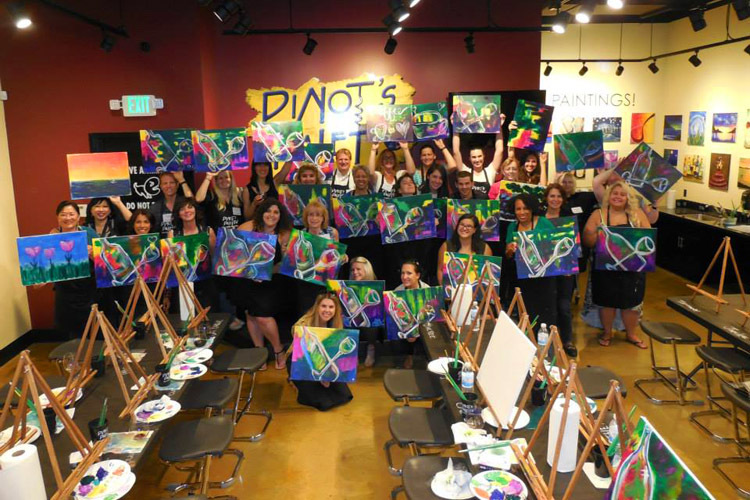 This is a fantastic idea for a girls’ night out, a date night, a private party, or for a corporate event! Classes are offered Thursday, Friday, and Saturday evenings and occasionally on Saturday and Sunday afternoons. The cost is $39 for 2-hour classes and $49 for 3-hour classes. 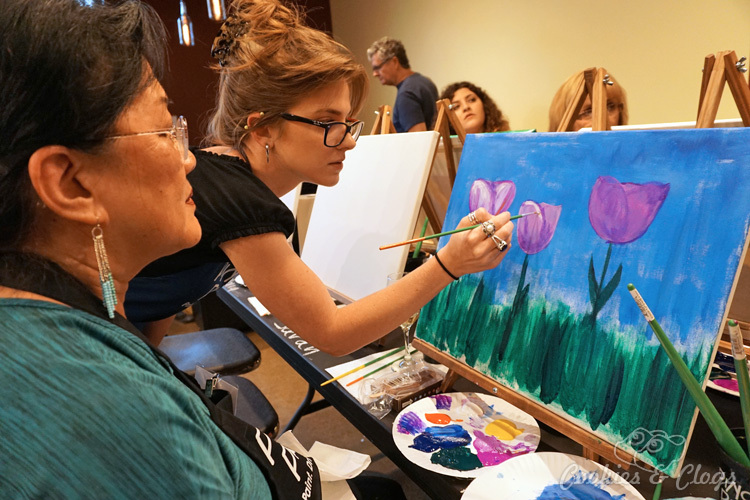 Check the calendar for a full schedule and to see what paintings will be featured during each class. Since alcohol is served, only those 21 and over can participate. I was invited, along with a guest, to attend a complimentary class with refreshments included. All opinions are my own.